Disclosure – SCM (SocialCafe Magazine) was provided FREE product(s) to complete this review. Romping Monsters, Stomping Monsters – Those little monsters are back — and on the move! 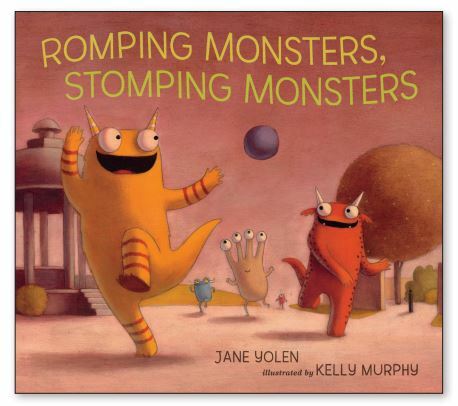 Jane Yolen takes her rhymes to the playground, aided by Kelly Murphy’s exuberant illustrations. Stretching, twirling, tumbling, jumping! Welcome to a playground teeming with monsters, bristling with energy, and scaring up ways to have fun. Monsters swing and slide and piggyback ride. Monsters run three-legged races and fall on their faces. In this high-octane sequel to Creepy Monsters, Sleepy Monsters, wild and whimsical artwork revs up a read-aloud text that will have little listeners jumping up to join the action. We recently got a chance to review this colorful and fun book. This is one of those books that young readers love. The pictures alone tell a story and the text is easy for them to read and fun to understand. We enjoyed reading this book and our 8 year old definitely loves reading it to the younger kids in the neighborhood. We hope you will check it out as well because we definitely recommend it. About the Author: Jane Yolen, author of the companion book Creepy Monsters, Sleepy Monsters, has written hundreds of books for children and young adults, including the New York Times best-selling How Do Dinosaurs Say Good Night? With Candlewick, she is the editor of three children’s poetry collections: Switching on the Moon, Here’s a Little Poem, and This Little Piggy. She divides her time between Massachusetts and Scotland. Romping Monsters, Stomping Monsters is perfect for ages 3 to 5, with 32 pages, costs $14.99 and it’s available from July 2013. For more info and to order this book visit Candlewick Press website! Disclosure – SCM (SocialCafe Magazine) was provided FREE product(s) by the above mentioned company or their PR Representative to complete this review. All of the opinions are strictly of the SCM (SocialCafe Magazine) and SCM (SocialCafe Magazine) staff and no one else. The opinions are honest and not influenced by the monetary compensation in any way.